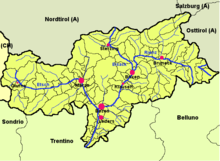 The following is a list of municipalities of the autonomous province of South Tyrol in northern Italy. South Tyrol is divided into 116 administrative subdivisions (Gemeinden/Comuni). Both German and Italian are official languages in this province. Some municipalities have a third official language, Ladin.